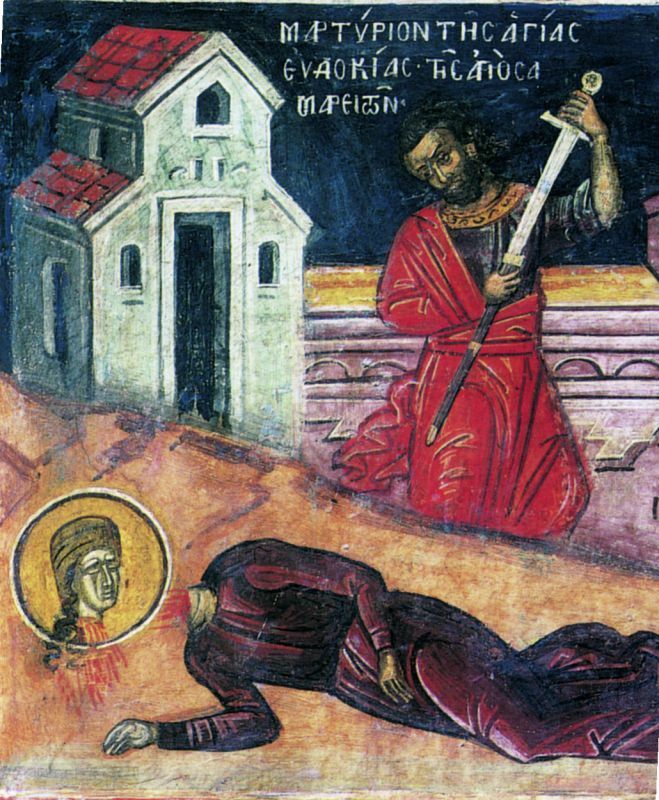 Holy Monastic Martyr Eudokia was a Samaritan, a native of the city of Heliopolis in Phoenicia (modern Baalbek), who lived during the reign of Trajan (98-117). Her pagan impiety took her off the good path, and for a long time she led a sinful life. Her soul was deadened and her heart hardened. Eudokia awoke one night at midnight and heard singing from the house of a Christian woman next to hers. A monk was reading from a book which described the Last Judgment, the punishment of sinners, and the reward of the righteous. The grace of God touched Eudokia's heart, and she grieved because of her great wealth and for her sinful life. In the morning Eudokia hastened to call on the man whose rule of prayer she heard the previous night. This was a monk named Germanus, returning from pilgrimage to the holy places to his own monastery. Eudokia listened for a long time to the guidance of the Elder, and her soul was filled with joy and love for Christ. She asked Germanus to stay in her home for a week, during which she secluded herself in her room, and spent her time in fasting and prayer. The Elder Germanus told her to give away her wealth and to forget her previous life. Eudokia received holy Baptism from Bishop Theodotus of Heliopolis. She entered a monastery and took upon herself very strict acts of penitence. The Lord granted forgiveness to the penitent sinner and endowed her with spiritual gifts. After she had become the head of the monastery, the young pagan Philostrates (one of her former lovers) heard of her conversion to Christ and longed to see her again. Aflame with impious passion, he came into the monastery in the guise of a monk and began to urge Eudokia to return to Heliopolis, and resume her former life. "May God rebuke you and not allow you to leave these premises," Eudokia cried. Then the impostor fell down dead. Fearing that she had served as an accomplice to murder, the sisters intensified their prayer and besought the Lord to reveal to them His will. The Lord appeared to St Eudokia in a vision and said: "Arise, Eudokia, and pray for the resurrection of the dead man." Through Eudokia's prayers, Philostrates revived. Having been restored to life, the pagan begged the nun to forgive him. After he was baptized, he went back to Heliopolis. From that time he never forgot the mercy of God shown him, and he started onto the way of repentance. Some time passed, and another situation occurred. Inhabitants of Heliopolis reported to the governor Aurelian, that Eudokia had taken gold and silver out of the city and concealed it at the monastery. Aurelian sent a detachment of soldiers to confiscate these supposed treasures. For three days the soldiers tried in vain to approach the walls of the monastery, but an invisible power of God guarded it. Aurelian again sent soldiers to the monastery, this time under the command of his own son. But on the very first day of the journey Aurelian's son injured his leg and soon died. Then Philostrates counseled Aurelian to write to Mother Eudokia, imploring her to revive the youth. And the Lord, in His infinite mercy, and through the prayers of St Eudokia, restored the youth to life. Having witnessed this great miracle, Aurelian and his close associates believed in Christ and were baptized. When persecutions against Christians intensified, they arrested Eudokia and brought her to the governor Diogenes to be tortured. While torturing the saint, the military commander Diodorus received news of the sudden death of his wife Firmina. In despair he rushed to St Eudokia with a plea to pray for his departed wife. The monastic martyr, filled with great faith, turned to God with prayer and besought Him to return Firmina to life. As eyewitnesses of the power and grace of the Lord, Diodorus and Diogenes believed in Christ and were baptized together with their families. St Eudokia lived for awhile at the house of Diodorus and enlightened the newly-illumined Christians. Once,the only son of a certain widow, who was working in the garden, was bitten by a snake and died. The mother wept bitterly for her dead son, and asked Diodorus to resurrect him. Learning of her grief, St Eudokia said to Diodorus, "The time is at hand for you to show faith in the Almighty God, Who hears the prayers of penitent sinners and in His mercy grants them forgiveness." Diodorus was distressed, not considering himself worthy of such boldness before the Lord, but he obeyed St Eudokia. He prayed and in the name of Christ he commanded the dead one to rise, and before the eyes of everyone present the youth revived. St Eudokia returned to her monastery, where she lived in asceticism for fifty-six years. After Diogenes died the new governor was Vicentius, a fierce persecutor of Christians. Having learned of the accomplishments of the saint, he gave orders to execute her. The holy martyr was beheaded on March 1, 107. With an upright mind you bound your soul to the love of Christ. for you were not moved by earthly beauty. First you mortified the passions through fasting, then you put the enemy to shame by your suffering. Therefore, Christ has granted you a two-fold crown. 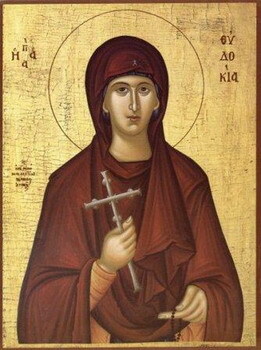 Glorious Evdokia, venerable passion-bearer, entreat Christ God that our souls may be saved! even after your death you bless us, pouring out wonders on us. that we be delivered from spiritual afflictions and may receive the grace of miracles.